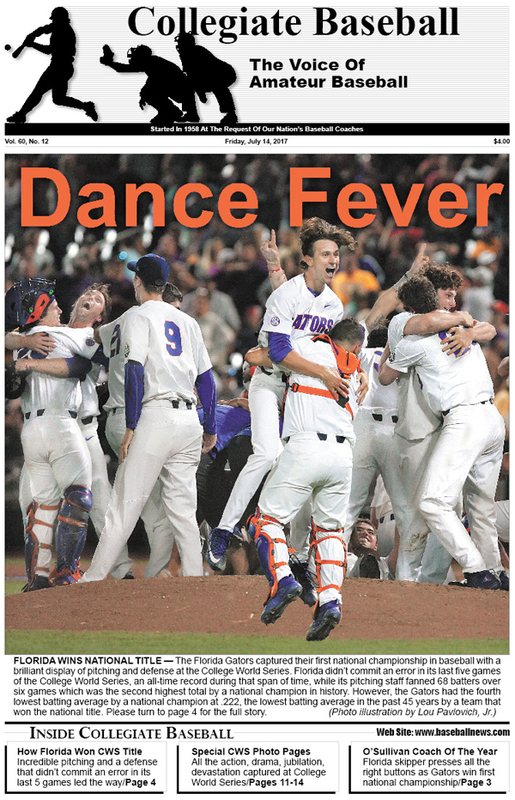 • How Florida Won The College World Series: Incredible pitching and defense paved the way for Gators’ first national title..
• 4 Special CWS Photo Pages: All the action, drama, jubilation, tough moments captured at 2017 College World Series. • College World Series Notes: Home runs jump at CWS, across USA. Viewership of event much higher than in 2016. • Kevin O’Sullivan National Coach Of The Year: Florida skipper does a marvelous job of leading Gators to first national title. • Box Scores Of Every CWS game: Check out any of the 16 games played in Omaha and what players did. • Oregon State’s Dream Season Explodes: Was it really necessary to report a felony which set off chain reaction of bad events? Read about the thoughts of Beaver Pitching Coach Nate Yeskie and why this was such a special season up to that point. • Golden Spikes Award Winner: Louisville’s Brendan McKay adds another honor to his long list in 2017. • ABCA Hosts 20 Clinics: Barnstorming clinics will be held throughout the Midwest and Carolinas. • Ruleball With Rich Marazzi: Here is an in-depth look at the nuances of the Infield Fly Rule. • Diamond National, Regional Coaches Of Year: Here is a rundown on all of the ABCA Region and National Coaches of The Year on all levels of high school and college baseball. • Florida No. 1 In Final CB Poll: Gators beat LSU twice in Championship Finals of College World Series to earn final No. 1 ranking in Collegiate Baseball Top 30 presented by Big League Chew Bubble Gum. • NCAA Div. I All-Americans: ABCA announces three All-American teams led by National Player of The Year Brendan McKay of Louisville and sponsored by Rawlings. • More Coaching Moves Across USA: Among many changes, South Carolina chooses Mark Kingston to lead their baseball team. • Charlie Greene Column: Attention to detail is absolutely vital to winning baseball programs. • Brian Cain Column: Athletes must recognize physical, emotional, mental states. • NCAA Div. 2 All-Americans: ABCA committee picks three All-American teams headed by National Player of The Year Zack Shannon of Delta St. and sponsored by Rawlings. • NCAA Div. 3 All-Americans: ABCA committee selects trio of teams led by National Player of The Year Pete Grasso of Salisbury and sponsored by Rawlings. • NAIA All-Americans: ABCA committee picks two All-American teams headed by Will Price of Oklahoma Wesleyan, National Player of The Year and sponsored by Rawlings. • Hit And Run: Al Figone explores why this play is disappearing from baseball on virtually all levels. • NJCAA All-Americans: Here are amazing athletes who were honored in Divisions I, II, III by ABCA Committee headed by National Players of The Year on each level and sponsored by Rawlings. • Pacific Division All-Americans: ABCA All-Americans feature three fabulous teams made up of elite players headed by Player of The Year Trevor Casanova of El Camino C.C. (CA) and sponsored by Rawlings. • What Makes Elite Baseball Coaches? : Pat Williams, the author of 48 books with thousands of interviews about why certain coaches and players excel in different sports, explains what the best coaches in the business are all about. • CB’s National High School Top 30 Poll: Shawnee (OK) High School wins the national title with a 40-0 record as the Wolves have now captured 52 consecutive games over the past two seasons. • High School All-Americans: ABCA honors the elite prep players in the USA with three All-American teams headed by National Player of The Year MacKenzie Gore of Whiteville H.S. (NC) and sponsored by Rawlings. • Scouting Your Opponents: Hall of Fame skipper Jim O’Brien explains his tricks of the trade in gaining an edge. The article also includes an outstanding chart that was designed by Tony Bloomfield and Jno Shuler of Cosumnes River College. To purchase the July 14, 2017 edition of Collegiate Baseball or subscribe, CLICK HERE.